Our adventure was underway at long last, and cresting the mountain, I gazed across the wide barren valley that would become our home for the rest of the day. The trail would wind down through the andean peaks, eventually disappearing into the valley far below, up and down hills for the next few days, past streams and tiny villages. Condors, soaring high above, waited for signs of weakness in the pack. Some of the trail was actually still cobblestone, a testament to why the incas were all obliterated by a culture that already knew about cement and decent roads. They got bored with building about half-way through however, and much it of was just your everyday, average hiking trail through the boring, uninspiring Andes. Off we slogged, hard and fast, down the craggy shale-encrusted peak, knee cartilage crushed to bits on the harsh incline, backs and thighs burning, an epic battle of man vs wild. We figured 10 minutes of it was probably enough for the time-being, and stopped for lunch. I think ‘lunch’ consisted of 1 tin of tuna each and portions of James’ homemade inedible Beef Jerkey, which, despite my many attempts at it’s destruction, still managed to appear out of his bag every chance it got. I wouldn’t be surprised if he’d forgone clothing and sleeping provisions and just stuffed his bag full of 50Kgs of the wretched stuff. In a scene strangely reminiscent of last week’s adventures, the only food-like fauna we saw on the entire first day was a fish with the probable nutritional value of an underweight ant. And, just like my later attempts with his oceanic brethren, no manner of coaxing with sticks would get him out of his watery abode and relieve him of life. I was immensely glad we’d reconsidered our food options before leaving, and begrudgingly starting chewing some more jerky. Accomplished travelers would no doubt be aware of ‘Bolivian Belly,’ which can come upon a man like a thief in the night, or quite literally, a pudding in the pants. It was James, unfortunately, who was struck, and in his prime too, long before his time. We’d been hiking most of the day by this stage, and the vista was starting to look a little greener. Under the guise of being a caring fellow adventurer, I said I’d stay behind with him while he fertilized a nearby grove of trees in cramped anguish. To be honest I was half-dead after hiking all day and wanted a rest too; caring little for James and his leaking buttocks. Jeremy, ever the conqueror, strode on ahead to set up camp before dark at the campsite which James assured us existed but was less than reassuring when quizzed in his sweaty stupor about it’s exact whereabouts. Don’t get any grand delusions about the ‘campsite’ either. It was almost flat, and contained grass. That was the sum total of its qualifications. We finally made it there, after ignoring what I thought were at least 4 passable camping sites, finally reaching Jeremy at what felt like 2am, and discovering he’d neglected to pitch the tent and was instead waiting for a team-effort. So we labored in the darkness, the burning resentment staving off the cold as settled in for the night. In the morning, after replacing my useless, crumpled spine with one of the tent rods and cursing my backpack designed for a mule, or the the hunchback from Notre Dame, I discovered the campsite was actually quite a lovely little clearing near a stream that we’d see time and time again at various stages of our voyage. In true outdoorsman/adventurer style, breakfast consisted of some kind of American breakfast food containing marshmallows and aspiring to be added to the cereal food group. It was like eating a bowl of soggy Skittles. With sugar and Sprite poured on top. Thankfully I was able to metabolize the approximately 2Kgs of sucrose contained therein rather quickly; and sped off down the the trail. The shaking made running in a straight line difficult, but the ever-present thought of impending death-by-cliffside helped. From time to time we’d see other groups on the trail, usually tourists or Europeans. The Bolivians were all too smart and took the bus. Unlike Americans, you can always pick europeans by their evolved sensibilities, like hairy legs for both men and women. A much cheaper way of keeping population growth at a sustainable level. One group crossed our path several times as we paused to dine on more tuna and jerky for lunch, or as they frolicked in the river while we trudged along, searing back pain showing through our forced smiles. Midway through the afternoon it started to rain and by the time we reached the next camping area it was dark, and we were wet and cold, and to make matters worse some fool had put a raging river in the way. By some miracle we managed to get the tent up and were settling in for yet more á la carte Jerky when the europeans showed up. I think there was one guy and 3 girls, so who knows what suffering he’d endured on the trip so far. We helped them all across the river which seemed a little more substantial than earlier, because my underwear was damp when we finally returned to the tent. Could have been the fear. Now freezing in our sleeping bags and suspicious of everything european, we once again tied to settle in for the night. I couldn’t feel my toes, which may have been from the river, or the sudden onset of diabetes from breakfast that morning. We were startled by movement and a voice at our tent door. Our fellow traveler had come by to offer his thanks with a bottle of wine for saving his life and the lives of at least 2 of his female companions. I wasn’t a drinker, but anything was better than jerky at that point, and at least maybe some wine would help the back pain. “No thanks,” said James bluntly, explaining our religious background. Our new heathen friend graciously disappeared back into the night, taking the wine with him. It got very quiet then; even the rain seemed to have paused, such was the awkwardness. Jeremy gave James a stink-eye that would have killed Superman and proceeded to throttle him. As they thrashed about, stabbing each other with forks, I drifted off to sleep, blissfully ignorant of my pungent eau de Jerky, looking forward to the days ahead. These people have a much better, factual account of the Bolivian Inca Trail with actual pictures and true bits. 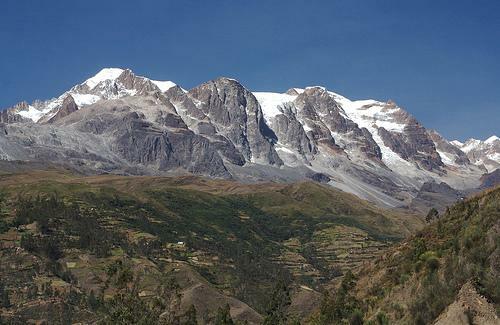 Posted in Adventure, BoliviaBookmark the permalink.